I was long biased during the pre-market hours. Took a long at VWAP/50% area for a quick .125% loss. Once it broke down, I was still long biased but quickly losing it. 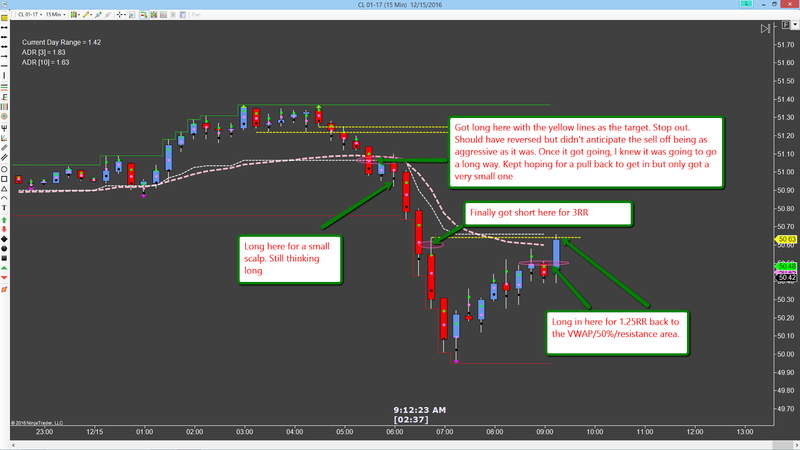 There was a support level that I took for a small scalp, basically enough to recover the earlier loser plus a few ticks. Then I started looking for a decent pull back to get short off of and it never really came. So I eventually took a very shallow pull back with the same .125% stop on a VERY small time frame so I could dial in the risk as close as possible. No heat at all and it went to my 3RR target very quickly. In hindsight, I should have just reversed my early long trade but I didn't have a plan for that and I didn't and don't chase.